Last summer Dan Ghenacia was digging through his own record collection when he found a ‘rare gem, a priceless Italian jewel’. Back in the ‘90s when he first picked up the EP, Dan was spinning the B-side, with no vocal. Back to present time, and after a few weeks of pondering, Dan decided to give the vocal version a spin. Apparently, the track quickly became a total bomb in fact, sending clubbers crazy both in the clubs and online, where nobody has been able to identify it. Intrigue has surrounded the track over the past year, with a ceaseless hunt for the mysterious track proving fruitless. 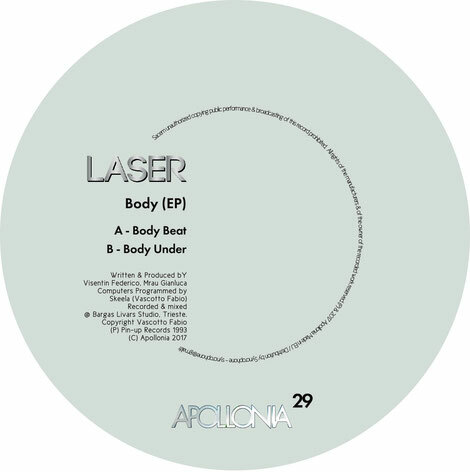 Apollonia are proud to finally unveil this old school killer with an exclusive repress of ‘Body Beat’ originally released by Laser on Pin Up Records in 1993. This early-90s organ-led production is uplifting and groovy, with heavy beats powering the track along, apparently illuminating dance floors around the world every time Dan has played it. On the A-side is ‘Body Beat’, the vocal version that has been doing so much damage, while on the flip is ‘Body Under’, which is more of an eyes-down, moody roller. It’s out end of July on vinyl only, check some snippets of it below.